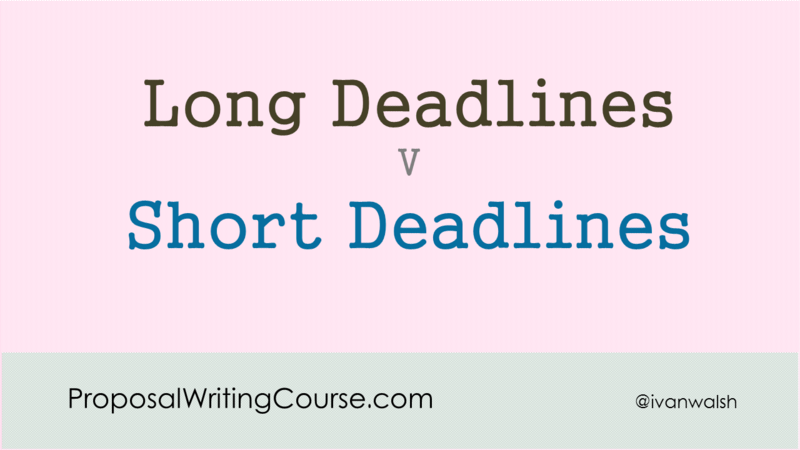 Here’s a suggested approach if you need to write a proposal with a short deadline. For example, if you have been asked to take over a bid or grant application at the last minute or if your company decides to bid on a procurement tender (RFP) towards the closing date, then the following guidelines will help you get organized. What this means is that you read their guidelines, and as you read, try to understand why they have prioritized specific issues. If you can read between the lines, so to speak, you will grasp what is most important to the sponsor – the so-called emotional triggers – and align your bid to resolve these issues. Submission deadline – this is the date they need to receive it by, not for you to send it out. Make sure you can get it posted and delivered by this date. If necessary, send it by registered mail, UPS, FEDEX etc. Number of copies – do they want it on CD or do they want two, three, four print-outs? Again, factor this into your production stage as you need to check 1) that the printouts are bound correctly, 2) they are packed correctly and won’t be damaged during the delivery, 3) you have enough ink, paper, and binding materials. Delivery address – this may not be the same as the agency’s head office. Check that your address labels are printed corrected – do not smudge – and have the correct zip codes. Phrasing – avoid using your own ‘in-house’ phrases, especially in the headings. Instead, use the phrases specified in the RFP and build your response around these. This works for several reasons. One is that is shows the reviewers that you’ve read the bid and absorbed the terms they used. Second is that it avoids any ambiguity that could arise if you use alternative headings. Keep things simple for you and the reviewers by using these common phrases. In addition, if you notice that the RFP writers have used a specific phrase, one that is repeated possibly several times in the bid, use this and variations of this in your response. They have obviously chosen this phrase as it means something specific to them, even if it’s possibly jargon. However, if you’re unsure what it means, get clarification so you don’t use the term incorrectly or out of context. By the way, contacting the project sponsor is a nice way to highlight your interest in the bid and to highlight to the issuer that you’re determined to understand their underlying requirements. Instead of trying to write the proposal in a single sitting, or as one unified document, break it up into smaller sections. This helps you feel you’re making progress as you can tick off each section and also allows you to delegate sections to other team members, if possible. Create subsection and subheadings that match what’s in the request for proposal or invitation to tender document. Mirror the RFP section headings as close as possible. Another writing tip is to create the Table of Contents first. Then put in single one line summaries for each section – simply as a placeholder – and then start on each section. Note: make backups every now and then. Even if the document hasn’t changed all that much, either send yourself an email with the working draft or save it to a shared network location. Something I find helpful is to start a new chapter, ie section, on a new page. Somehow this orients me in the document and also works well when printed out, for example, if the Costs section is printed out, it starts on a new page, not in the middle of a page. Double check your figures, daily rates, and budgets several times. Look at them from different angles. Why? If the grant provider feels you are trying to play with the numbers, for example, to hoodwink them in some way, they are not likely to shortlist you regardless of the quality of your bid. Also, as the costs section is often the FIRST section to the read, even before the Executive Summary, get this chapter reviewed by someone outside the project, i.e. who is neutral and won’t tell you what you want to hear. Encourage them to find mistakes. The abstract is both a distillation of what’s in the bid and also a way to compare what’s in your bid against the RFP. I’d suggest that you write the abstract only after you have completed the first draft and then allow time to refine it. Why? As you develop other drafts, you may want to highlight specific items in your response, especially as you are likely to develop a better understanding of the requirements once you’ve had a chance to digest the material. Again, give yourself time to write, revise, and refine your abstract. Don’t leave it until the end. Instead, see it as a small independent document that’s developed in tandem with the proposal.